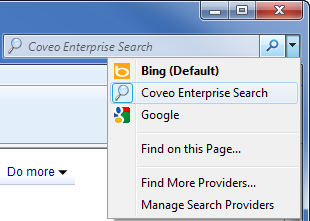 The Coveo administrator can publish an OpenSearch provider document for a Coveo .NET Front-End search interface to allow end-users to access the .NET search interface directly from the built-in search box of their web browsers (see Coveo Search From a Browser Built-in Search Box). Select Search Interfaces > Features. In the Current Interface drop-down box, select the interface for which you want to publish an OpenSearch provider. In the navigation panel on the left, select OpenSearch Provider. In the Name box, enter a descriptive name that clearly identifies your Coveo search interface. This is the name that appears in the list of available search engines in the browsers. In the Description box, optionally enter more information describing the search interface associated with this OpenSearch provider. Let your end-user know that they can access the Coveo search interface from the search box of their browser (see Coveo Search From a Browser Built-in Search Box).